Cape Horn – Groupama were the first team to round Cape Horn on Friday, passing the mythical maritime milestone at 1255 GMT in what was an emotional moment for the crew. 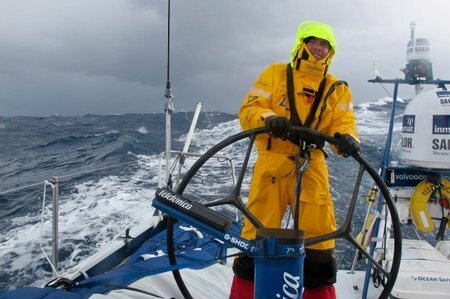 “Passing Cape Horn is a huge relief for us,” Groupama skipper Franck Cammas said after 12 days of hugely demanding sailing since the fleet left Auckland. Groupama were followed round at 1352 by PUMA Ocean Racing powered by BERG with all the sailors up on deck in preparation for a celebration. The pair now face a tactical battle over the remaining 2,000 nm through the South Atlantic to the Leg 5 finish in Itajaí, Brazil. Groupama and PUMA’s crossing into the Atlantic was in contrast to the other boats, three of which face upcoming repairs due to structural damage, and a fourth which is on a commercial ship headed to the United States. Southern Ocean – The fleet of boats in the Volvo Ocean Race 2011-12 have taken a beating just over 10 days after leaving Auckland, New Zealand for Leg 5 of the Volvo Ocean Race 2011-12. Massive 10-meter waves and powerful winds as high as 40 and 50 knots in the Southern Ocean have wreaked havoc on the fleet, breaking one team’s rudder, causing de-lamination to hulls and structural damage to several boats. Four boats in the fleet of the Volvo Ocean Race 2011-12 have had to initiate repairs on their boats out at sea. One of them, Chinese-entry Team Sanya, has already returned to New Zealand, where the boat is being shipped to the United States with plans to restart the race from Miami for Leg 7 in May. Overall race leaders Team Telefónica, currently in third position, announced that they will need to make a pit-stop in Ushaia, Argentina, for repairs before continuing on to Itajaí, Brazil. CAMPER with Emirates Team New Zealand, currently third in the overall standings, have slowed their boat speed and are headed for Chile, where they will stop in Puerto Montt to fix structural damage. Fifth-place Abu Dhabi Ocean Racing was forced to carry out considerable repairs out at sea on Friday due to hull delamination and are currently assessing their options. Meanwhile, current Leg 5 leaders Groupama sailing team and PUMA Ocean Racing powered by Berg are steadily making their way towards Cape Horn – the only two teams yet to suffer serious damage on this 6,700 nautical mile leg from Auckland to Itajaí. Boats have been blasted by big sweels and sailors swept across the decks in some of the most difficult conditions faced so far in this 11th edition of the race. Leg 5 was expected to take around 18 days to complete with teams scheduled to arrive April 4 into Brazil. The new arrival date for the top two, Groupama and Puma, is estimated for April 6. Southern Ocean – Abu Dhabi Ocean Racing pulled off a heroic repair operation in the depths of the Southern Ocean after discovering delamination in their hull. Skipper Ian Walker supervised an incredible five-hour job that saw 30 bolts screwed through the hull of Abu Dhabi’s boat Azzam (which means ‘determination’ in Arabic) to prevent further damage. In order to carry out the repair, the crew had to slow the boat to a standstill and tilt it onto its side in heavy weather so bowman Justin Slattery, lowered overboard secured to a rope and in full safety gear, could tighten the bolts on the outside of the hull. Inside the hull, boat captain Wade Morgan and watch leader Craig Satterthwaite braced the damaged section with parts ripped from the boats bunks, stacking system and lockers. “We’ve basically joined the skins back together with a mechanical fixing,” Walker said. The damage was discovered in darkness, so the crew waited for daylight to effect repairs. It’s the second major repair the Abu Dhabi crew have had to carry out in Leg 5 from Auckland, New Zealand, to Itajaí, Brazil. The team chose to return to Auckland within hours of starting the leg to repair structural damage to a bulkhead in the bow. Walker said he was in talks with his team about how to progress, and that all options were open. “The message is we’re in good shape,” he said.